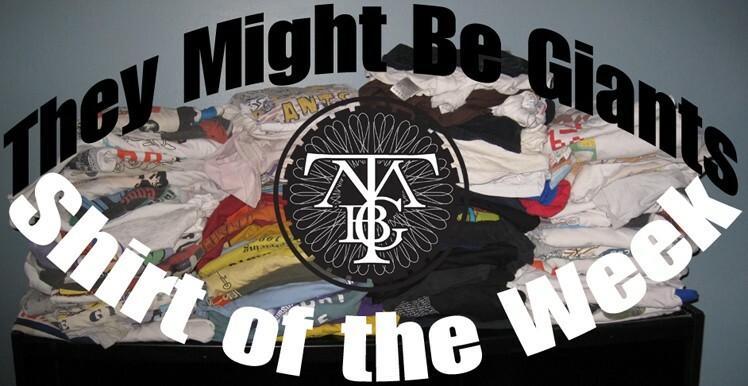 Welcome to a special video edition of TMBG Shirt of the Week. 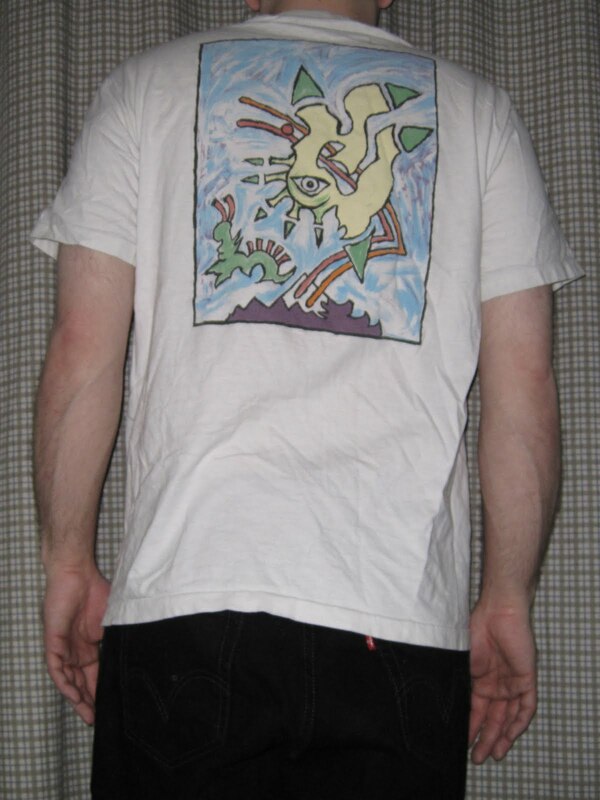 I first laid eyes on this week's entry behind the merch table at a late nineties show at the Bowery Ballroom in New York City. The most plain TMBG shirt I had ever seen, it was simply the band name in white block letters on a black shirt. When I inquired about it, I was told that some of them were recently unearthed in their warehouse, and that it's the first shirt that the band ever produced. Sold! 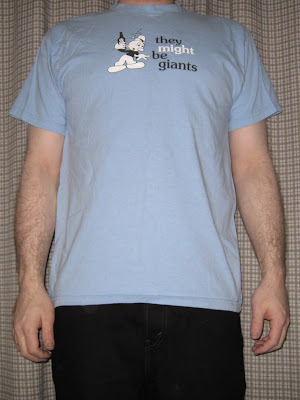 Here's a short fan video that I shot last week for a special They Might Be Giants Awareness Day project conceived by my friend Kelly, in which I'm wearing the debut shirt. She produced a string of clips submitted by various fans, and it was subsequently posted on TMBG's own Facebook page. You can watch the full fan video here. Here's a sequel video that I just shot for this entry, in which I'm wearing an alternate gray version of this week's shirt. As in the video, I'd like to remind you that the Join Us Preview EP is now available for purchase on theymightbegiants.com, iTunes and amazon.com. 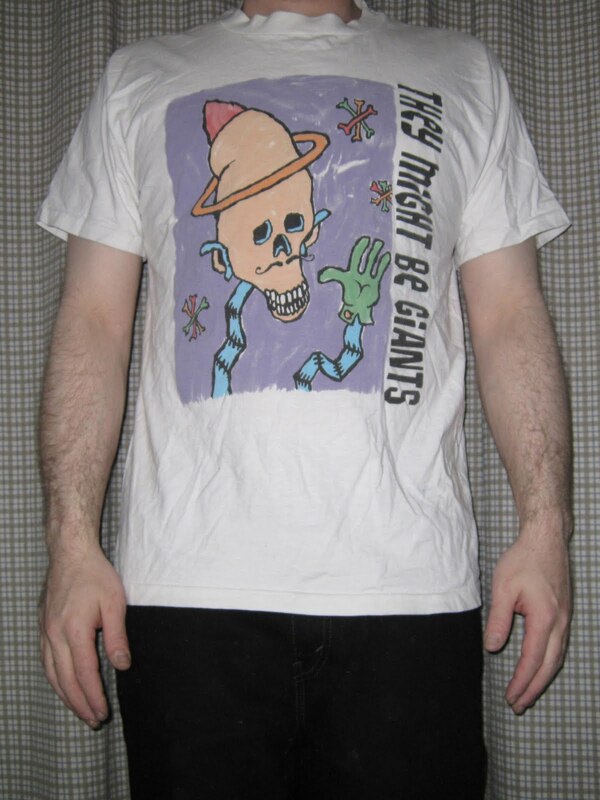 And if you order from the official band site, you can get the newest TMBG t-shirt, with the Join Us cover art. Like I always say, you can never have too many of those. A rare performance from 12/31/87 in New York City. 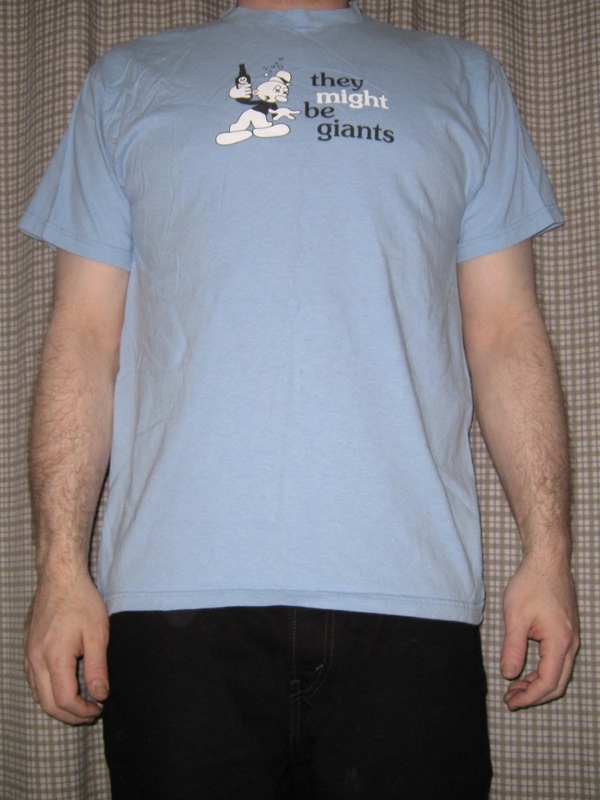 In honor of They Might Be Giants awareness day, I give you my coveted TMBG Street Team t-shirt. Actually, bad choice of words. You can't have it; this one's mine! The style of the text on this one completes the "baseball tee" look. I'm on the team!! 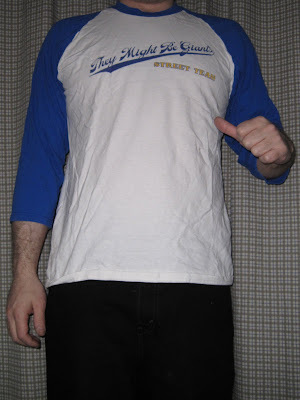 I received this shirt in 2004, during the height of the Street Team promotion. I volunteered to hand out some fliers to the folks lined up for a couple of TMBG shows at NYC's Irving Plaza. The flyers advertised for an off-broadway run of People Are Wrong!, just around the corner at the Vineyard Theatre. In addition to the shirt, I was awarded a free ticket to the play on the date of my choice. While I was busy with my assignment, I missed an appearance of comedian Mike Myers, who reportedly arrived early and was ushered inside. I later saw him enjoying the show from the balcony, and later still from backstage. "(I've Learned the Value of) Human Sacrifice"
Performed on 4/29/97 at Cabaret Metro in Chicago, IL. I'm just running out to the merchandise stand.. I'm back!! And I purchased Skully... you gotta check this ouuuuuuuttt. When The Skullivan waves at you from a shirt..
You'd had better wave back or you might get hurt! Okay, so I guess that this isn't really The Skullivan, but the song has always made me think of this shirt. It's a friendly, hip, new-age, halo-wearing, glove-sporting, mustachioed skull guy. I think that he's playing jacks. 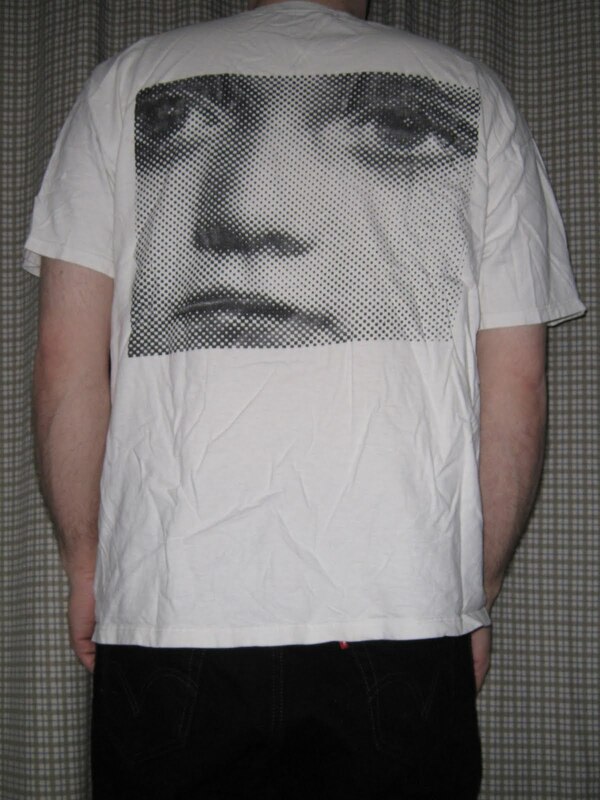 Designed by Meat Puppets guitarist Curt Kirkwood, this shirt should please even the most skull-obsessed phrenologist. On the back is a slightly more abstract painting that kind of reminds me of a Picasso. Featuring the "CD Fast-Forward Version", performed at Toad's Place in New Haven, CT on 4/16/98. Here's a shirt that showcases one of my favorite logos. 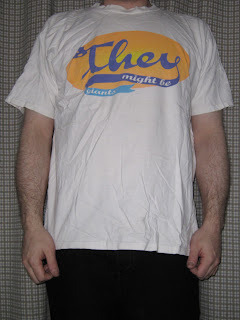 Using a script font, the y in "They" creates a swooping banner which encapsulates the remainder of the name. On the back is an image first used inside the Why Does the Sun Shine? single: It's the face of Pearl, played by child actor Sally Jane Bruce in the 1955 film The Night of the Hunter. Pearl has also been used as a backdrop for TMBG's live show. An improvised performance featuring The Stick at the Mercury Lounge in New York City on 12/18/97. I got a ride home with a Drunk Guy. How ungrateful I must have seemed. He showed me how to spin my head round and round. Trying to kill the pain, or just forget? So are TMBG. To celebrate They offer this drunken fan, complete with cartoon-style drunk bubbles. I also have this shirt in gold, but it's the Drunk Guy on Blue that's still available at the TMBG Merch Store. Celebration! Nicely performed with an eight piece horn section at the Celebrate Brooklyn! Festival at Prospect Park in Brooklyn, NY on 8/19/00.